Wow, I wasn’t aware they got even one Republican vote, and I watched the vote live on C-SPAN. Did someone change their vote later? Does this take into account the idealogical distribution within the two parties? I would bet that the variation within the Democrats is far greater today than in recent history and the Republicans is more consolidated with a midpoint farther towards the right (given recent elections). This would partially account for the drastic variation between the parties in terms of votes (i.e. it is easier for Reps to vote in a coherent block as well as more likely that as a whole they would agree to oppose the legislation the way they did). Every democrat is grabbing at straws right now. They have ALWAYS twisted words and spun things with emotion and are layered with such hypocrisy that people who pay attention get sick. Because there are people out there who believe what they hear when they hear it on the television. One clip of Obama spouting off on those evil Insurance Companies will fester in the mind of a sheep for a long long long time. They cant see past the “beauty” of their new entitlement even though it may be a the expense of personal liberty. They – democrats – continue to utilize every detail to twist as political gain, knowing they have the media on their side, they exploit even the “acts of violence” that are a result of the democrats forcing this bill onto the American people. arg… anyone who is paying attention should be fired up. Admittedly, this viz doesn’t take into account much more than simple vote counts. But it does give lie to the line that Republicans are reflexively against major social legislation. Additionally, a few moments of research shows that, for legislation of this magnitude, it’s actually pretty rare to have a vote that is this partisan and this close. What Republican voted yes on health care? I looked up the votes again and don’t see any. So, regarding Lehrer, you are technically right- things weren’t as partisan for those votes, but the legislature was just as divided, but not by party. The main cleavage in the legislature was between Southern Conservatives of both parties (primarily Democrats) versus northern liberals of both parties (about evenly distributed). Party ID only started becoming a strong indicator of ideology in the early 1970s when the Southern Strategy and its fallout began to realign the parties around attitudes about race (Hence Johnson saying that he had lost the South for Democrats). Conservatives opposed Civil Rights. Conservatives opposed Medicare. And those battles were highly divisive by ideology (partisan, if you will). What Lehrer meant (but did not say nor did he clarify) was that since realignment, the partisanship has redistributed itself along regional and ideological lines and that today’s Republican party closely resembles the factions that voted against civil rights. He made a common mistake of viewing the past through the lens of the present. No, those votes weren’t partisan, per se. But they were divided deeply along the salient political divisions of the day- that is to say, region and ideology- just like the healthcare reform vote was was deeply divided by today’s salient political division, party. I’m not a conservative (Shock! ), but if you click my URL, you’ll see I have no problem defending conservatives and want them in the discourse. The problem I have with a visualization like this is that it elides critical historical context to make a point that is technically true but misleading. Regarding the two major social reforms of the 20th century, Conservatives held ranks to vote against them. Back then, there were a lot of liberal Republicans and a lot of paleoconservative democrats. Since then, the parties have realigned to more closely resemble ideology and region, and the modern Republican Party has chosen to follow (and cultivate) the path of the Southern Conservatives. I think modern conservatives need to deal with that legacy and can’t shake it just by claiming the mantle of Lincoln (not, as I recall, a state’s rights fan) and saying that modern conservatives are Republicans and that it was some other party that held up civil rights. While I can’t prove the counterfactual, I am willing to place a heavy wager that if the civil rights act were voted upon with today’s ideological/regional/PID distribution placed over the regional and ideological distribution of the 1960s, you would see the vote as just as partisan. That might make an interesting paper, actually. Though I have no idea what journal would be interested in publishing it, maybe Political Methodology? If the congressional leaders feel like they are supporting their constituents than why should it matter if it is partisan. It comes down to an easy talking point for demonizing any political vote. In reality the last time this country was this fractured on any particular issue was the civil war,and like the civil war I see the republicans coming around to the reform. I think as soon as they realize that abortion rates will go down after this reform, that will push a lot of them over. The fact of the matter is, abortion is the cheapest alternative, and if you give more medical care options to people who previously would not have had them, they will probably reduce abortions across the board. I was apparently using some other vote on the legislation. I’ve fixed the graph so that it reflects Sunday’s vote. I can’t really defend against your assertions without spending a month digging into the history books, so I will only say that your assertion would mean that the country has lurched to the right in the last 40 years. In essence, you’re saying that in the mid 60’s we had a 70% liberal congress that voted along partisan lines. But look at the Yay/Nay chart. You’ll see that vastly more Democrats (presumably including the “paleo-conservatives”, by your term) voted for Medicare/Medicaid than voted for the Civil Rights act. Similarly, far more Republicans voted for the civil rights act than voted for Medicare/Medicaid. These votes were hardly a year apart, but each vote was made up of different ideological coalitions. Yet you would have us believe that the partisanship that we see today was in place back then, along the same lines except that the conservatives were just ranged across part lines. I worry that too much of your assertions are just assumptions, based on a colored view of history that wishes conservatives were always on the wrong side of history. I’m having trouble pulling that conclusion from the data. Abraham Lincoln was a Republican. He didn’t really “come around” to reform. The republican party then and now are two different entities, but that’s not the point. I should have said “conservatives” instead of republicans. but anecdotally, remember that Nixon was looking to sign a universal health care bill. Unfortunately, DMONINATE won’t pick this up because it is structured to be standardized across congresses, but again, I’d be willing to wager that if we looked at interest group scores (say NARAL and the NRA), the mean will have shifted right if their scores are set up by some absolute rather than relative criteria. You’d really have to look at the legislative agenda to be definitive. I’m at work, so I can’t pull out all the references, but yes, the country has moved in a decidedly rightward direction over the past 40 years. to your second point that you can’t pull my conclusions from the data- that is the reason I have a problem with your infographic. My point is that your graph and your data are making a misleading argument by selecting data that are not adequately comparable to the current legislation about which you are trying to make a point. Your data selects out only PID for salience and selects only these votes. 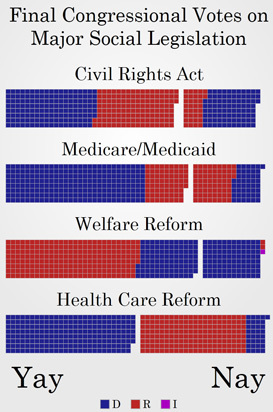 the fact that two of the votes you select are from a period in American politics when party ID was at a nadir and wasn’t the salient or critical political division (see below) and the third (welfare reform) is from the post-realignment era but under divided government and in the same congress that saw a majority switch in the house. about the difference between medicare and civil rights- now, I admit, the reason I commented on the graph is the first place was because I thought the depiction of civil rights was so misleading. However, if you look back to the realignment of the 1970s, what you see is the funneling of a two dimensional ideological structure into a unidimensional party partisan structure. The divisions of the 1960s were based on (1) fiscal conservatives vs. fiscal liberals and (2) social conservatives vs. social liberals, largely but not completely based on attitudes towards race. Fiscal Ideology maps roughly to 1960s PID, Social ideology/racial attitude maps better to regional cleavages. In the 1960s. This type of bi-dimensionalism was relatively unique and an artifact of the Great Depression and New Deal coalitions. The civil rights movement raised the intensity of attitudes towards race and race relations. Fiscal conservatives like Goldwater (himself a member of the NAACP) an Nixon (who had less sterling credentials on race relations) leveraged the intensity of feelings about race to bring socially conservative southern democrats over to voting for the fiscally conservative Republican party. Since then, leaders and elections have continued flattening the 2D system to a 1D system that re-established the supremacy of PID as the salient division in American Politics. so, in summary, you’re saying that people who talk about “conservatives (or Republicans) gave always opposed social legislation” are wrong and have a poor comprehensive understanding of political history. So, in fact, you agree with me, since that was part of the point of my chart. Good to find common ground like that. Also, re: the “lurch to the right” issue… I find that somewhat hilarious. I’m stuck in a broken car on the side of the road, so I can’t do much research, but the lurch to the right doesn’t explain why we don’t already have universal healthcare (surely the drastically more liberal US of the 60’s & 70’s would have demanded it). Of course, if it were true, it would bolster the argument that a legislative policy that was too liberal for a more liberal US of 40 years ago is definitely too liberal for a more conservative US of today. Which would mean that the Democrats are subverting the will of the people. Of course, this is only true if all your claims are true. I suspect the reality is somewhat more complex. Nice work! And nice commentary, too. I’m still amazed by how few people do ANY independent fact checking or research on what they hear on TV. To hear the media tell it, Republicans voted against everything, including the Civil Rights Act. 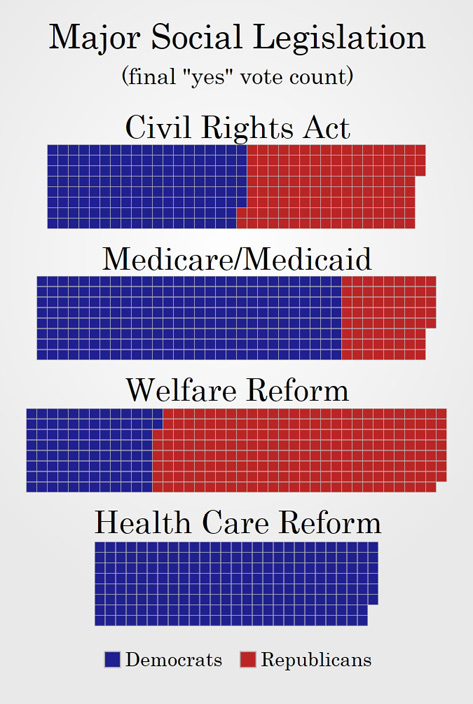 Your “Yay/Nay” shows that most major social programs won by clear majorities with bipartisan support. The current Healthcare Bill one by a simple majority with single-party votes. 1) Party strategy: Party strategy certainly plays a role when it comes to how individual politicians vote and the extent to which they will vote yes for legislation introduced by the opposing party. One variable that has no doubt contributed to the one-sided nature of the vote is the explicitly strategy from the GOP coming out of the 2008 elections. This wasn’t accidental—the party looked at what faced them and made a conscious decision to oppose much of the President’s and the Democrat’s agenda and, given the margins in both chambers, let them own whatever legislation they came up with. This would allow them to disown the legislation and run against it particularly if it was viewed as unpopular or controversial. I am not calling the Republicans obstructionist—simply pointing out that given where they were in December of 2008 this was viewed as a viable strategy by the party at a national level. Having such a strategy certainly will lead to some skewed vote totals by its very nature. Moreover, the party framed the Healthcare issue—and the Democrats initial solutions—in such a way that it became hard to imagine any Republicans voting for the final bill. They were going to turn it into Obama’s “Waterloo”, as some said. Once you frame the issue that way it is hard to pull back and vote for a bill given the expectations you’ve created with your constituents. 2) Vulnerable Seats: related, leadership will often release politicians who are in vulnerable districts once they’ve secured enough votes to pass a measure. This can lead to bi-partisan “no” votes and certainly did on HC reform. No votes can be just as strategic as Yes votes, so this can account for the variation within a party. 3) Ideology or politics? and further related, vote counts don’t tell us whether a politician was “convinced” of the merits of one side or the other. Politicians are rational, calculating creatures and significant weight needs to be given to the strategy of their vote. Is it possible that some Democrats didn’t agree with the HC bill? Sure. Is it equally possible that these Democrats reside in districts that were against the bill and there vulnerable come November if they voted yes? Absolutely. Once the minimum number of House votes was secured, reps from moderate to right-leaning districts could vote no–not necessarily because they were convinced by the other side (is there overlap, sure, but I tend to believe its 70% strategy and 30% personal ideology in politics). So certainly there is an argument to be made that you can extrapolate constituent opinion form the Dem no votes, but you can’t say the same for politician opinion. Bottom line: yes, this is an outlier in terms of major social legislation, but I think we have to explore the various reasons why beyond simply that one party wasn’t able to convince the other party (and some members of their own party) as to the merits of the legislation. What might be better (although I hate to do this) is to focus on right-left versus Dem-Rep. It is hard to argue that in general the right is just as supportive of major social legislation that has been passed in the United States as the left, since such an argument would run counter to foundational philosophical elements of the right. Major social legislation that we’ve seen usually entails some or all of the following: 1) expanding entitlements for citizens 2) expanding the role and size of government 3) creating a substantial financial obligation for the government which inevitably leads to greater taxes. It is hard to square those three/four elements with the core tenants of conservatism, but it is not so hard to square them with the left. The right approaches problems from a different perspective than the left, so we wouldn’t expect to see the same level of support for these types of bills generally. So to say that Republicans don’t support social legislation is misleading. I think it is quite reasonable to say that there are philosophical reasons why they don’t tend to support major social initiatives in the US, particularly those that were introduced by left-leaning Democratic parties and include some mix of the features I mentioned above. Ed, thanks for pointing out with more clarity what I was trying to say. Matthias, thanks for fixing the graphics and including the yea/nay graphic. Shouldn’t this part be updated as well (emphasis mine)? Nearly a fifth of the people who voted against health care reform were Democrats. So the “Republican” side of the issue managed to convince a number on the “Democrat” side, but the Democrats convinced only one Republican. *sigh* Turns out emphasis in a blockquote doesn’t look any different. I was referring to the last phrase. Suggest that you consider going back and look at the House Motion to Recommit. Believe that you will discover a much large partisan divide. It is my impression that our politics has become much more polarized, and I wonder if the partisan vote for health care is driven by that, and if it is more of a trend along with other votes. So, are we now into a “just say no” political era? Both the conservative and media outlets have noted how each side is not listening to the other, and this seems to follow through to personal political discussions, as well. I tend to be a moderate liberal, willing to look at both sides of the story. What I have found in this polarized atmosphere is that people on both sides are not even willing to listen to an argument, and that most items come back to talking points, such as “Death Panels”, or shoving this law down your throat. comment such as America died when Obama was voted in, not only show ignorance of our political system, but are really there to push further separation. The fact that this bill was so “partisan” does not really mean that it was not, what the people wanted, in general. These people were voted in to office, by the people, period. Many ran with a promise of health care reform, and that is what they gave the people. Yes, there is an argument about whether this bill was the exact thing the people wanted, and surly that is the major hot point of the debate. The biggest issue that I see is that the people answering polls, sawing they are for or against, are probably not the most educated on what is in the bill itself. They sit and watch TV, and pick up on the talking point, hot button issues that sway public opinion. Time changes, and politics change too. There were not Tea Partiers who yell obscenities and threaten law makers with physical harms. Republicans are pushed to the right further by their dealing/tolerance of the Tea Partiers. Sooo… are you ok with Democrats shooting up Jewish Congressman Eric Cantor’s Office? Or vandalizing Michelle Bachmann’s home? This is the classic ‘horrible graph’ …executed so half-assedly that more than one interpretation is possible. Sh*tty graphic design too, since it’s meaning is ambiguous. And the second graph (Yays and nays) is an even bigger disaster. That’s my guess too. How many new Rockefeller/ Lindsay Republicans are there. Remember when it looked like they were the future. I mean they are very much still out there in the political class but scared to death of admiting it. How exactly do you define “partisan legislation”? I must admit, I was unimpressed when, during the Bush administrations, the Republicans said that they were trying to be bipartisan but those icky, awful Democrats were just being so mean about it. I have no dog in this fight, so I’m simply amused to see the rhetoric shift from one side to the other without a hint of irony. Perhaps you are right. I have my doubts. I’m sure November will shine a bright light upon the matter. I’m just glad that no one yelled obscenities or threatened law makers at the anti-war rallies when Bush was in charge. I guess it goes to show how much more evolved the liberals are, they would never call to burn their opponents in effigy. Still trying to decide if you meant to be funny. If not, I guess playing that game with you would be less entertaining for you than it is for me. 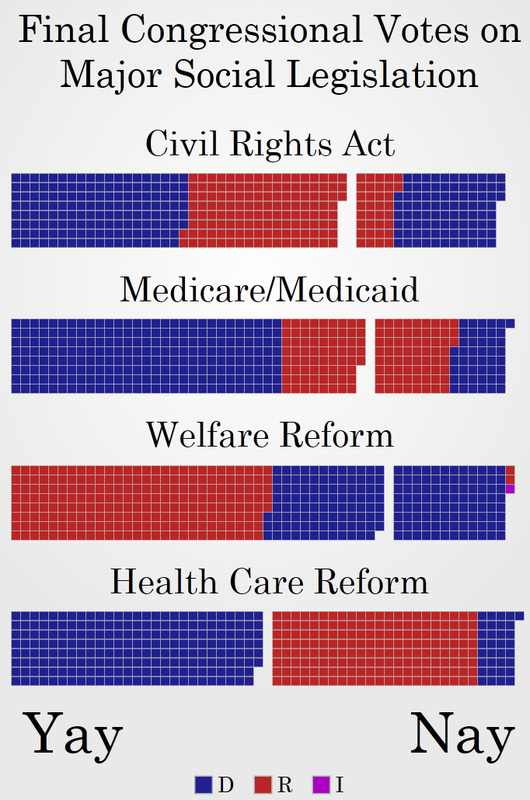 It would be really interesting to see this kind of viz by legislation catogery (eg, health care, defense spending, education, etc) This might really help to outline current and historical ideological divides between the parties, and by extension among the American public. Like you said, Medicare D was a similarly partisan vote. I wonder if healthcare just strikes a nerve that makes it almost impossible to cross the aisle. Oh, also I thought you should check out this contest for clever and creative visualizations/analysis for government related data. You should submit! DJ: No one shot up Cantor’s campaign office–the police issued a statement a few hours after Cantor’s presser that the bullet hole was the result of random gunfire into the air. 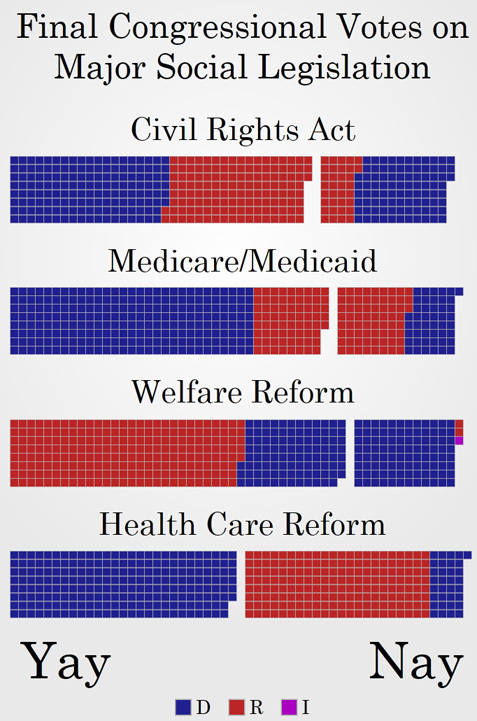 Could you add the 1935 vote for Social Security into your visualization? Is it worth showing beside these charts a map of which CDs were red and blue at the time of each vote? I agree with you overall in that Republicans have not historically been against social reform (after all, a major plank in the 1956 Republican Party platform was the passage of universal health care! ), but I do take issue with the Welfare Reform Act being cited as social reform. Granted, I realize you’re trying to take a representative sampling of various social reform issues over the past 50 years, but the so-called Welfare Reform Act was a terrible piece of legislation that basically took away a huge chunk of the FDR “social safety net” by requiring that various forms of welfare relief automatically expire after 24 months (and can be used for no more than a total of 5 years of an individual’s life), and basically put nothing in place to replace it. A federal or state welfare-to-work program, such as once existed in Minnesota (not sure if it’s still in effect), would have been a great help, but I don’t think funding ever hit. Welfare “reform” such as was passed in the 1990s was more like welfare deform. Since the bill actually contains a lot of things that Republicans supported at one point, you’d be naive not to think that the only reason Republicans voted against this bill was to score short-term political points in the mid-term elections. For one thing, the bill is pro-insurance companies since everyone has to now purchase insurance and there isn’t an option to buy into a public plan subsidized by the government. Can you tell us why the Democrats opposed it? Was it because they wanted to score short-term political points in the mid-term election? Or was there perhaps less myopic explanation? When the previous legislation was passed, many in the opposing party may have wanted to weaken the President by opposing his legislative agenda. However, some still had the courage and foresight to cross party lines, to show leadership, to put their country ahead of their party. Upon Obama’s inauguration, the Republican Party placed such principled action largely off limits. The graph reveals only that the Democratic Party did NOT dictate party loyalty on healthcare, while the Republican Party did. In hopes of crippling Obama, conservatives made clear: oppose healthcare, or else. That explanation is accurate and sufficient — and requires less gnashing of teeth all around. The way I have heard it is that Republicans fought Medicare tooth-and-nail, but when it came to the final vote and they knew that they were going to lose many of them voted for it (http://www.npr.org/templates/transcript/transcript.php?storyId=112234240). That’s often the case in Congress, people know ahead of time whether something will have enough votes or not before the actual final vote comes. So if they are on the other side of something that will pass or fail, it’s tempting to shift your vote to the other side particularly if you think something will be popular even if you don’t think it will be the right outcome. Another issue is compromise (and the lack of compromise that seems like the word of the day in Congress now), where a minority faction will agree to go along with a version of a bill that is toned down more to their liking. In that case a yes vote on something like Medicare might indicate that the voter was supporting the final version of the bill that was more limited in scope than the original proposed version. In that case their vote could reflect the fact that they’re agreeing to this compromise, rather than that they agree with the fact that it’s passing at all. I don’t know that this is what happened with Medicare, but the Wikipedia page for it seems to indicate a lot of compromises along the way (http://en.wikipedia.org/wiki/Social_Security_Act_of_1965).